Excellence is found in the little details done well. Big impact often happens in the seemingly small moments. Little adjustments can create a "wow" factor. Greatness is reached one small, intentional step at a time. Here are 20 of those "little things" that can make a big difference in your ministry. 1. Having greeters interact with people not only when they are coming, but when they are leaving as well. 2. Reserving the best parking for guests. 3. Asking parents ahead of time how long you should let their child cry before paging/calling them during the service. 4. Walking guests to their room instead of pointing. 5. Using people's name when addressing them. 6. Having a designated area where moms can park their strollers. 7. Text volunteers on their birthday and tell them what a gift they are to you and the ministry. 9. Enough toilet paper in the bathrooms. 10. Putting an "I've been changed" sticker on diapers after changing in the nursery. 11. Sending a handwritten note rather than a email. 12. Volunteers taking kids' prayer requests home and praying for them during the week. 13. Thanking volunteers more for who they are than for what they do. 14. Saying the words "I believe in you" to a pre-teen. 15. Keeping the pencils sharpened for small group leaders. 17. Having a separate check-in line for guests. 18. Getting down on your knees and looking a preschooler in the eyes when talking to him or her. 19. Cleaning & disinfecting the nursery items after each service. 20. Playing fun, cheerful music in the hallways before and after service. Your turn. 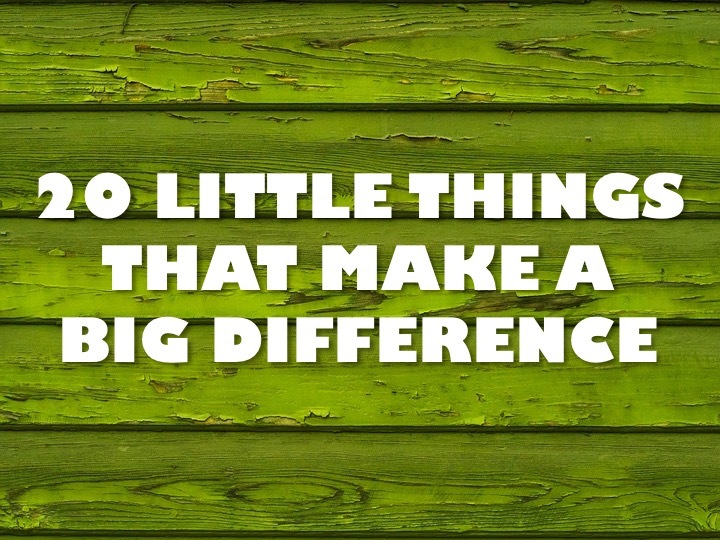 What are some other little things that make a big difference? Share your ideas and thoughts with us in the comment section below.